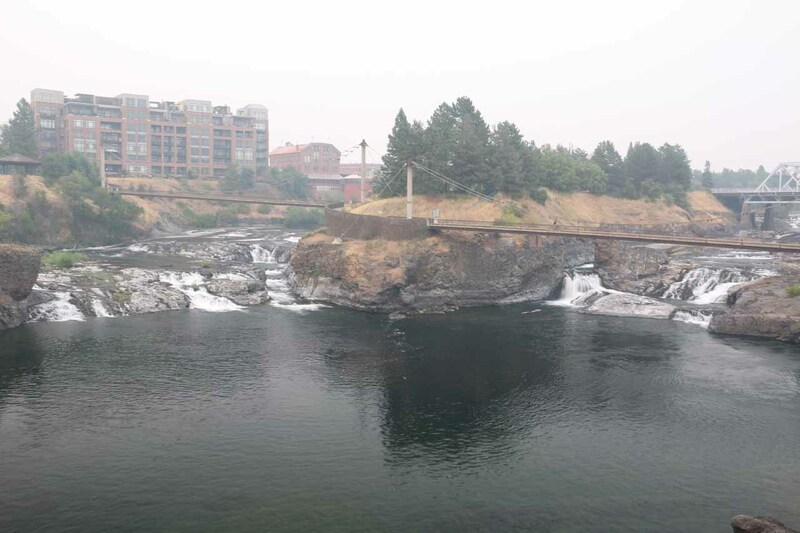 Spokane Falls was a waterfall that had quite a bit going for it despite its urban downtown surroundings and main-modified characteristics (supporting a pair of hydroelectric diversion dams). 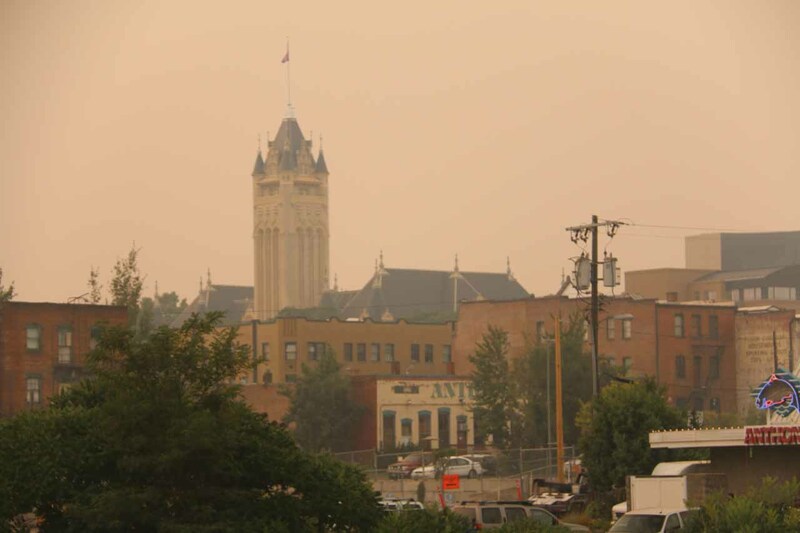 We also had to contend with some nasty thick smoke from the British Columbia wildfires that happened to blow towards Eastern Washington during our visit in August 2017. 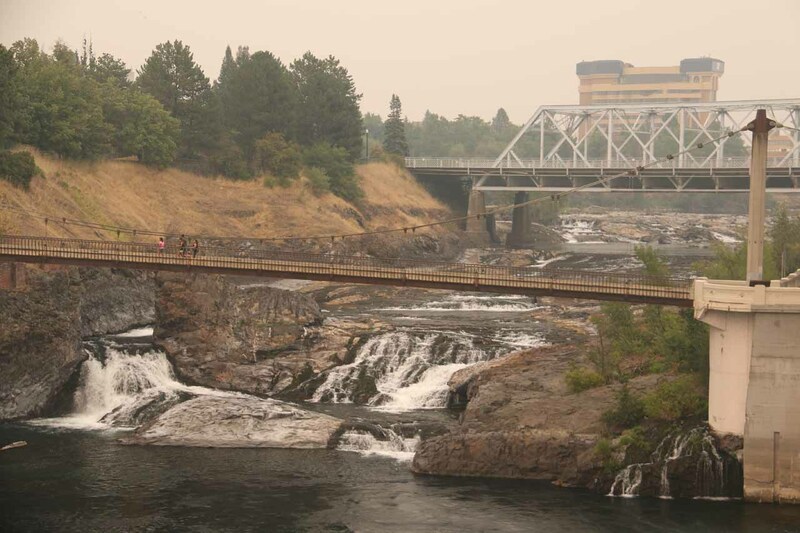 In any case, the waterfall consisted of two main sections – the Lower Spokane Falls and the Upper Spokane Falls. 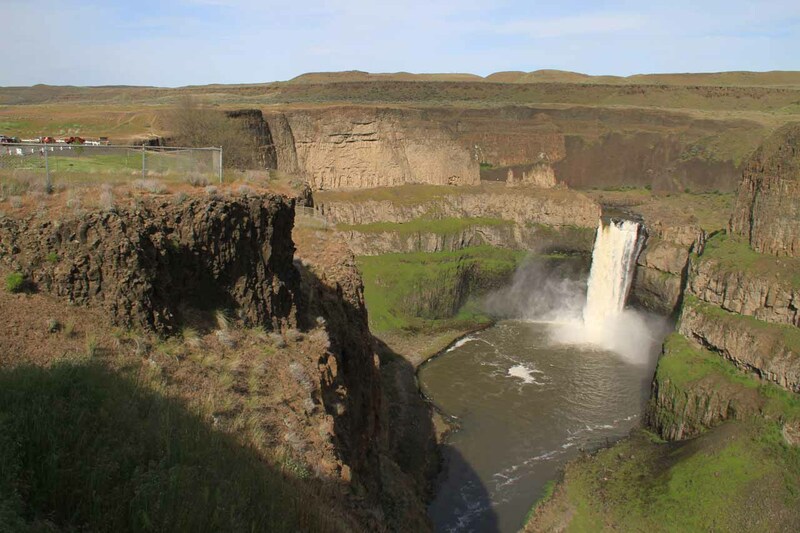 The Lower Falls appeared to be where the Spokane River channeled into a narrower rocky chute tumbling over a few cascading tiers. 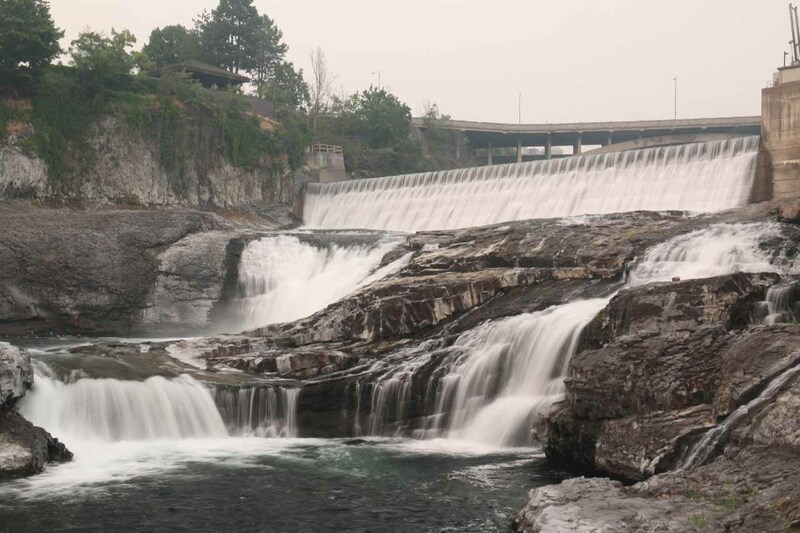 The uppermost drop of the falls was modified to support the Monroe Street Dam. 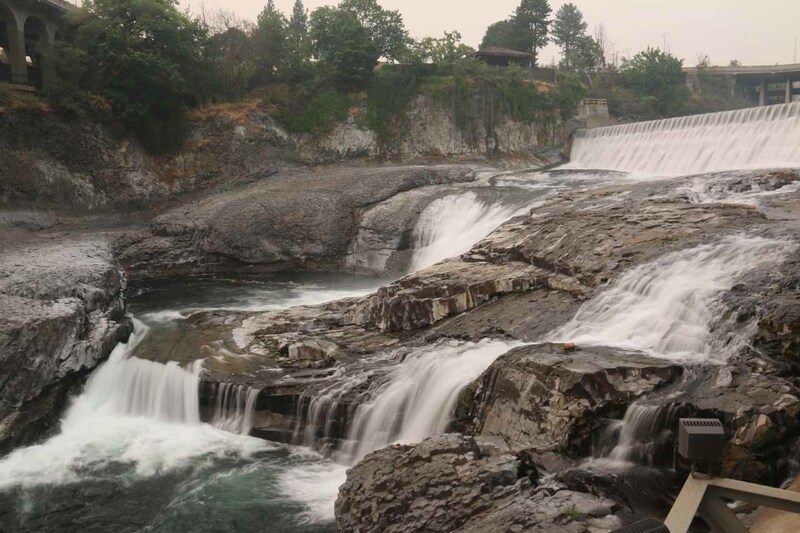 The Upper Falls was a wide two-segment drop split by Canada Island. The Upper Falls Dam took in water from the south channel (right side as you face it). Thus, its volume was affected though we didn’t find it that noticeable during our visit. 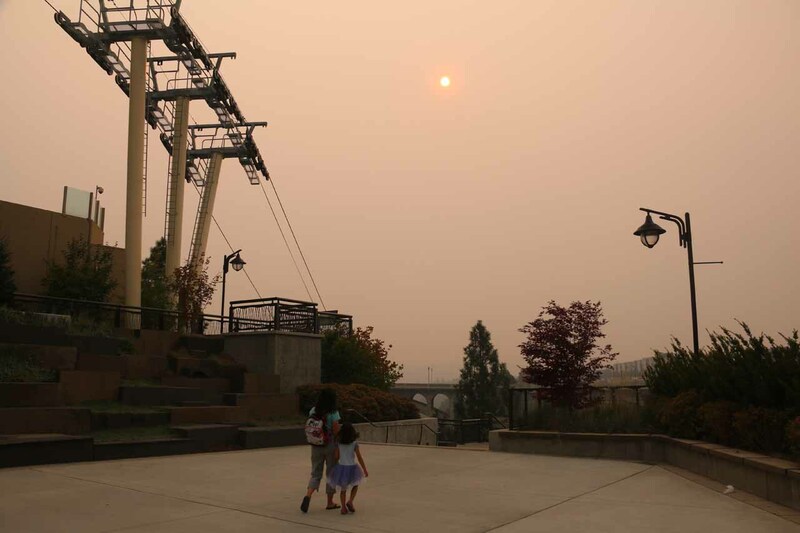 Unlike the Willamette Falls in Oregon, there was quite a bit of infrastructure already set up to allow the public to enjoy this falls. 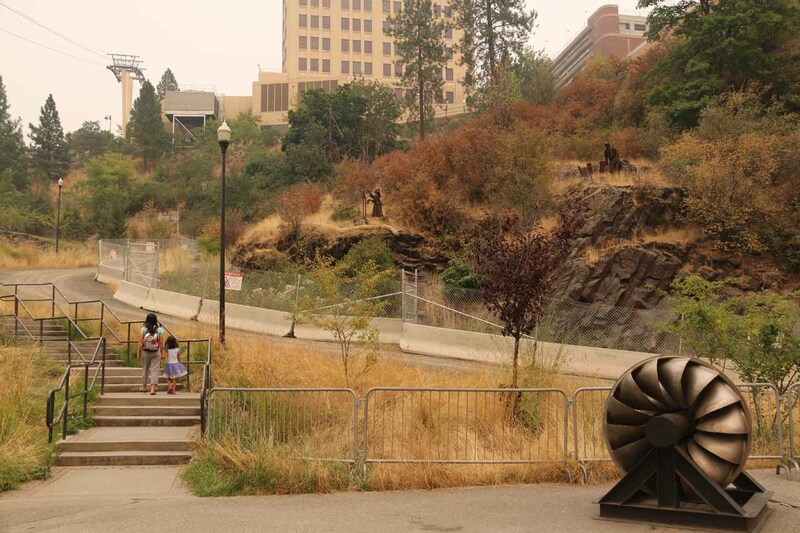 In fact, it ran pretty much ran through the heart of downtown Spokane (though Oregon City is working to open up access to Willamette Falls in the future). In addition to the waterfalls, there was also the Riverfront Park, some greenspace trails across Canada Island, the River Park Square Shopping Mall, and the heart of downtown Spokane a block or two further to the south. Indeed, there was still a lot going on here even though the Riverfront Park (which featured some exhibits, walking trails, and even carnival-like rides) was closed for construction. 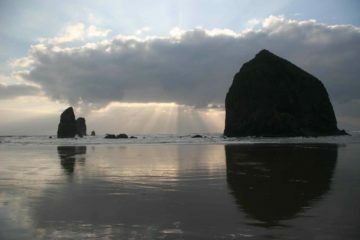 It definitely contrasted with the Oregon City experience. 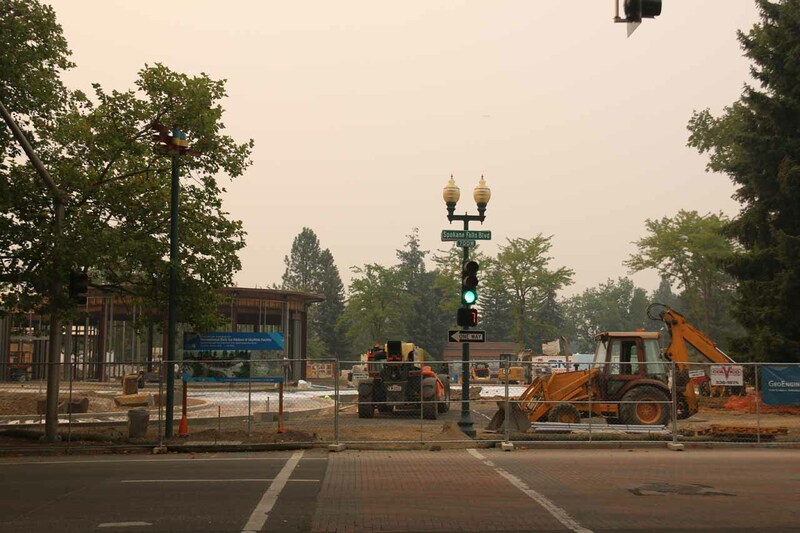 In fact, it made us wonder if the restoration going on over there intends to pattern itself after what the city of Spokane had been enjoying here since the city’s re-birth from the early 2000s. 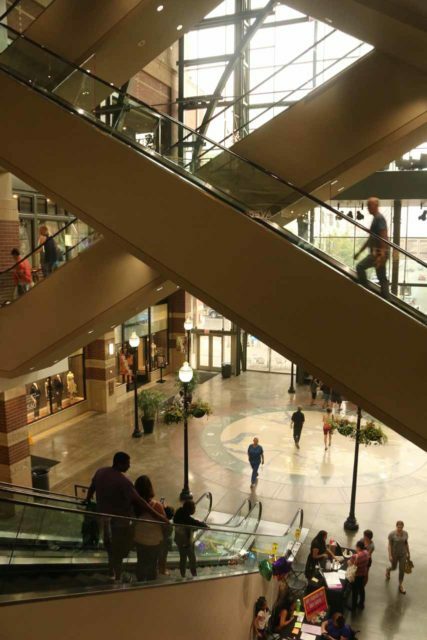 In our visit, we walked from the River Park Square Shopping Mall onto North Post Street. Then, we went down some steps to our left descending between some cable car pylons (apparently belonging to the Skyride gondola), Spokane City Hall, and the Mobius Science Center. 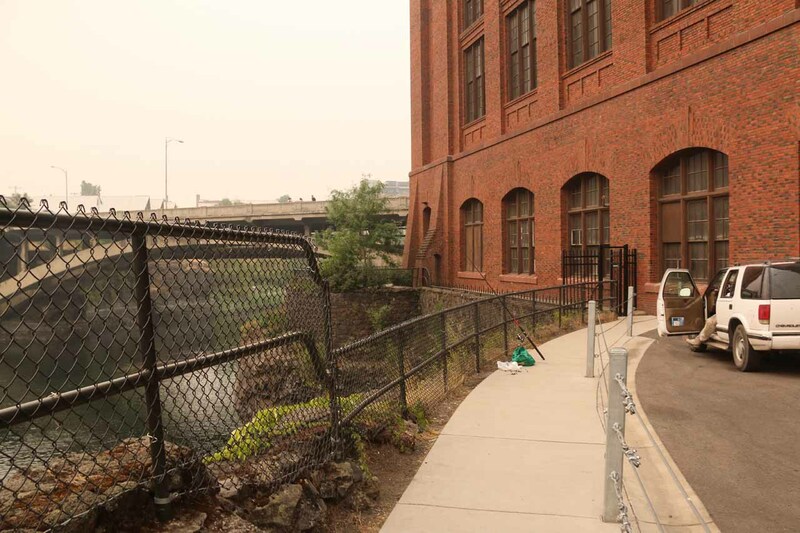 The path continued down towards the Monroe Street Dam, where we could look upstream towards part of the Upper Spokane Falls beneath the North Post Street Bridge. 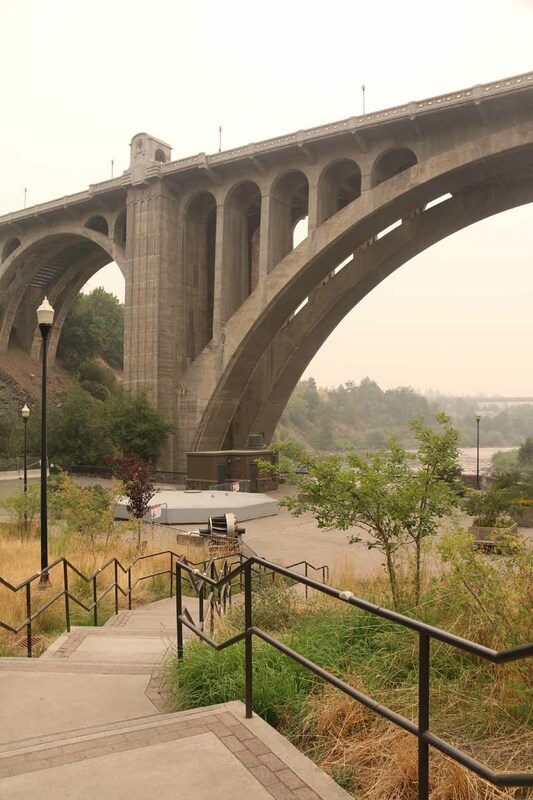 The steps continued down along the banks of the Spokane River towards a lookout area almost directly beneath the pillars of the Monroe Street Bridge. 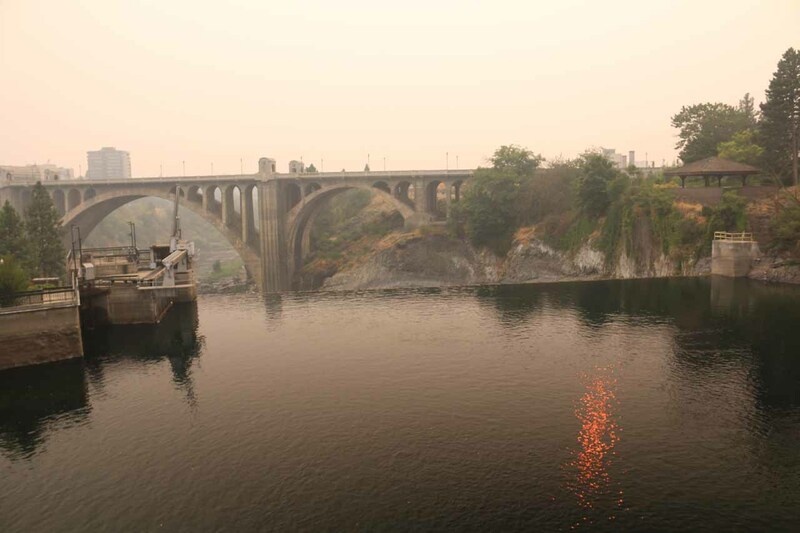 This lookout yielded our closest views of the Lower Spokane Falls. One of my regrets about this visit was not seeing the Lower Falls from the Monroe Street Bridge. 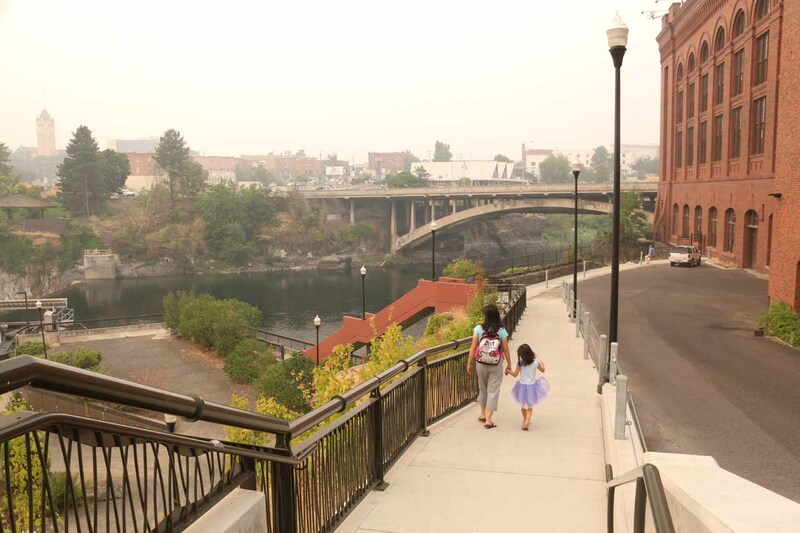 However, that would require backtracking to West Spokane Falls Blvd then walking along North Monroe Street to the middle of the road bridge. 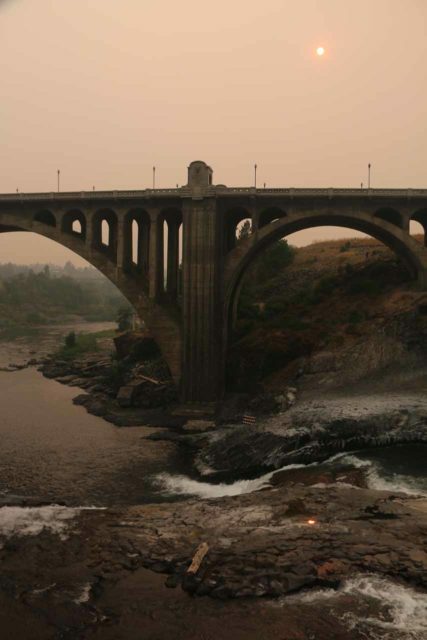 There was no direct access from the Lower Spokane Falls Lookouts to get up to the Monroe Street Bridge. 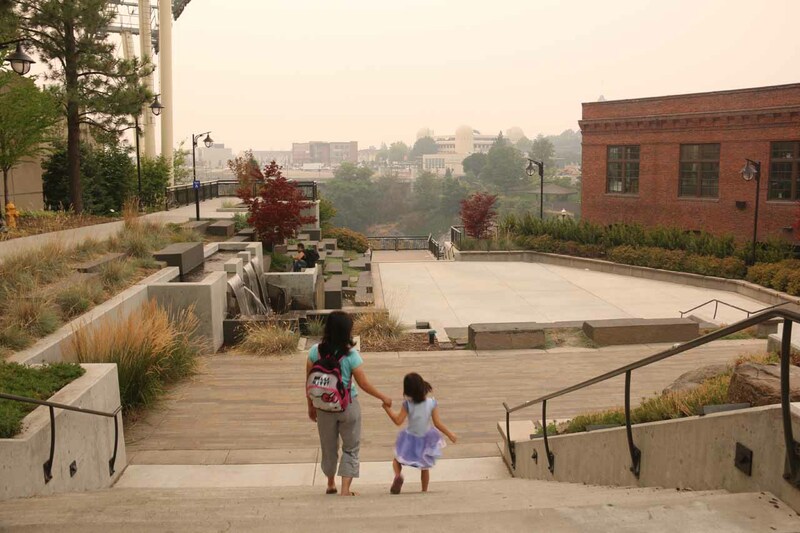 After having our fill of the lower lookout, we then walked back up the steps before Julie and Tahia returned to the mall while I checked out the Upper Spokane Falls. 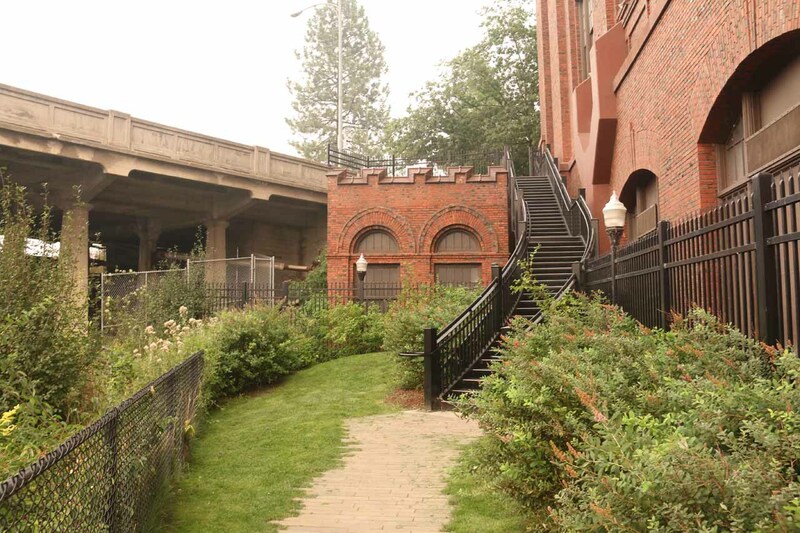 There was a narrow corridor sandwiched between the Spokane River and Huntington Park, and that was where I went up a few more flights of stairs before regaining North Post Street. 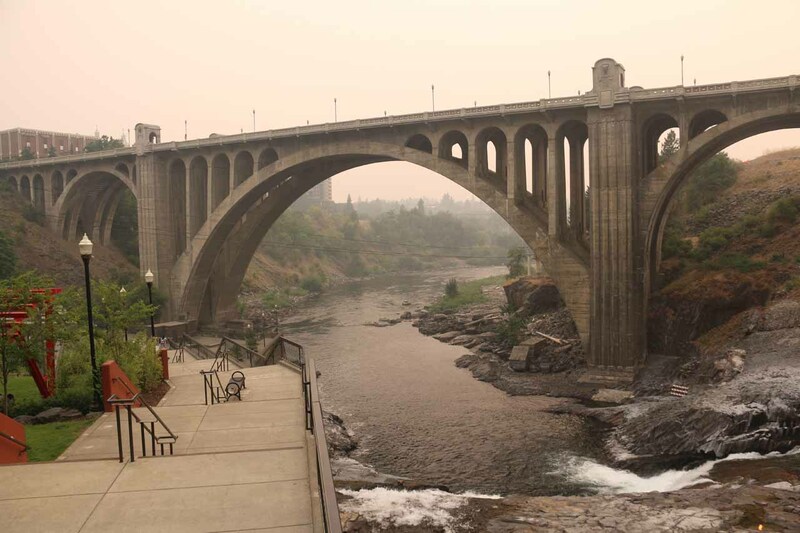 From there, I checked out the falls from a gazebo overlooking the Upper Spokane Falls as well as the North Post Street Bridge itself. 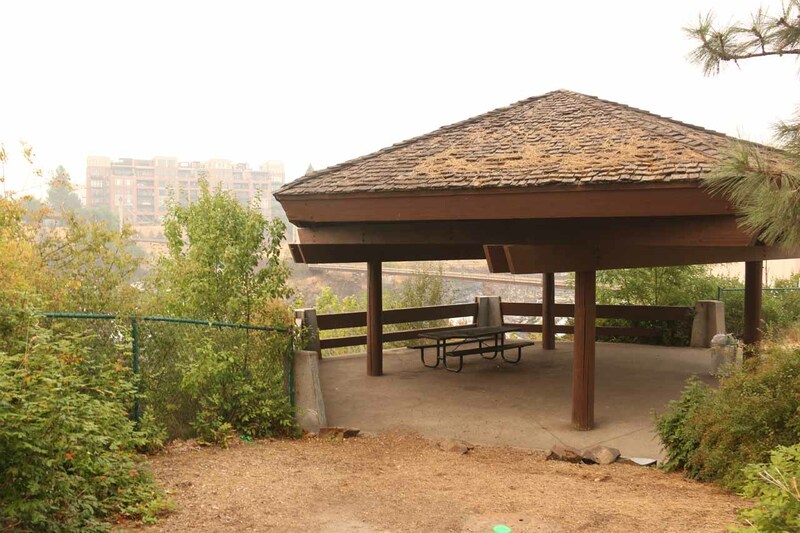 The photo you see at the top of this page came from this lookout. 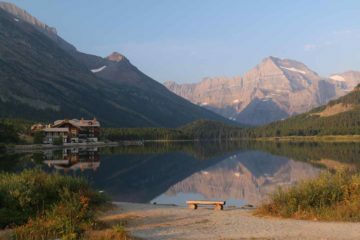 This was about the extent of my waterfall experience here because I had to limit my exposure to the thick smoke from the British Columbia Fires to the north. 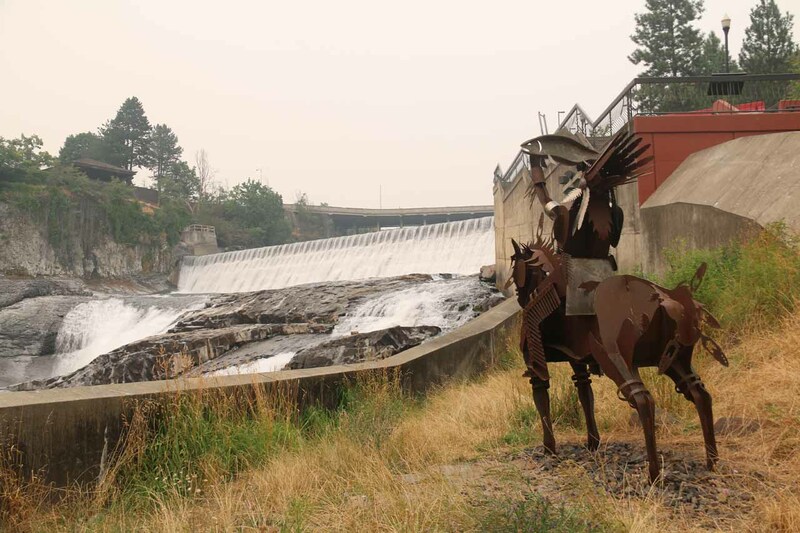 Nonetheless, I very easily could have extended my visit by going on the trails traversing the Spokane River via Canada Island upstream from the falls. 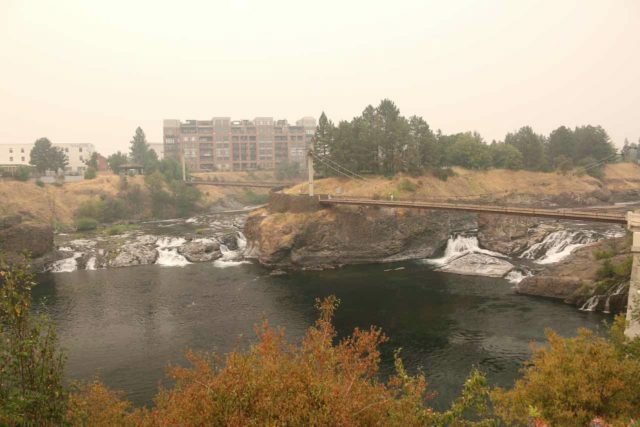 I also could have explored some of the trails on the north bank on the Spokane River for a different perspective of both the Upper and Lower Falls. 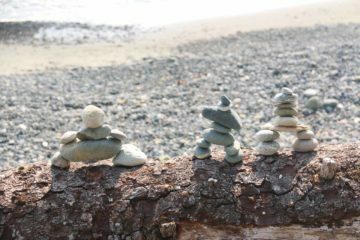 Overall, I spent about 45 minutes or so. 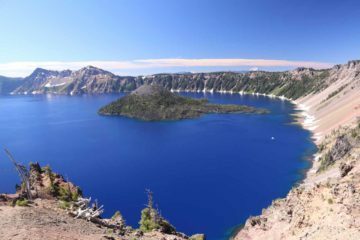 However, we could have easily extended our visit to a half-day or longer, depending on how many of the activities here you wanted to do. 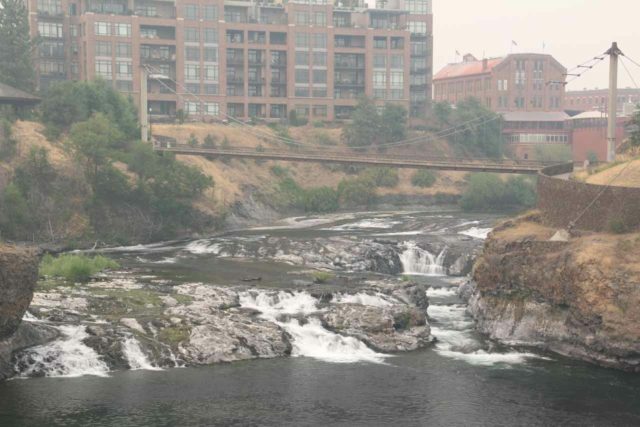 Spokane Falls resides in the city of Spokane, Washington. For information or inquiries about the area as well as current conditions, visit the Spokane Tourism Board website. 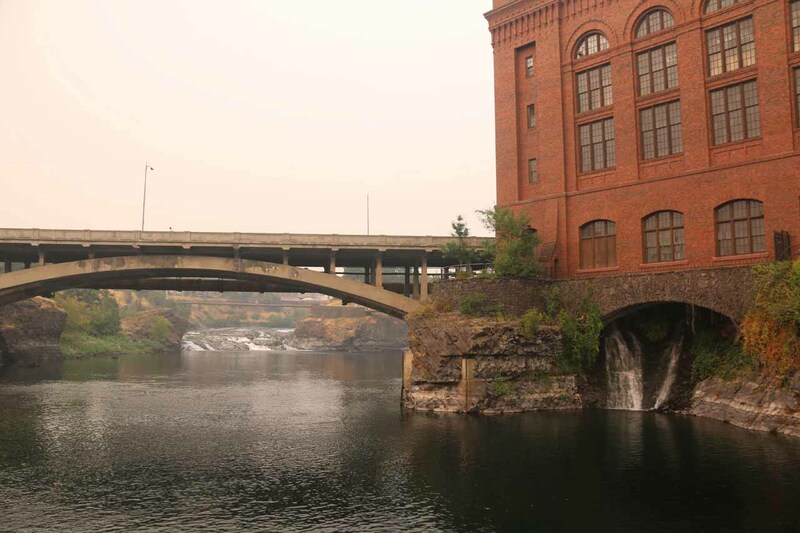 Spokane Falls was pretty much in the downtown Spokane area. We’ll describe the driving directions as if you were headed east on the I-90 going into the city. So driving east on the I-90, we took exit 281 for Division St (also for US2 east and US395 north). We kept left at the fork to go north on Division St. After about a half-mile, we turned left onto East Spokane Falls Road. 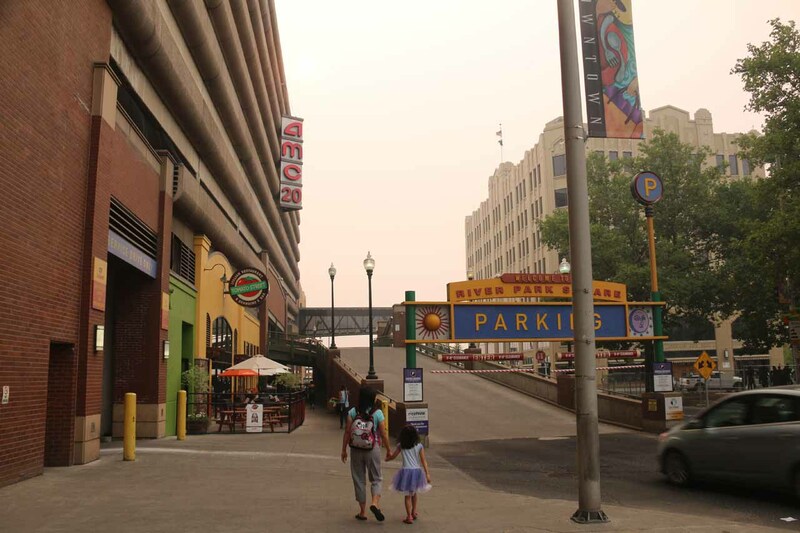 Then, we continued going west on Spokane Falls Rd for about 0.6 miles before encountering N Post St. We actually opted to park in the River Park Square Shopping Mall on the left (they charged about $1.25 per half-hour during our visit) though there was some metered street parking along North Post Street on the right. 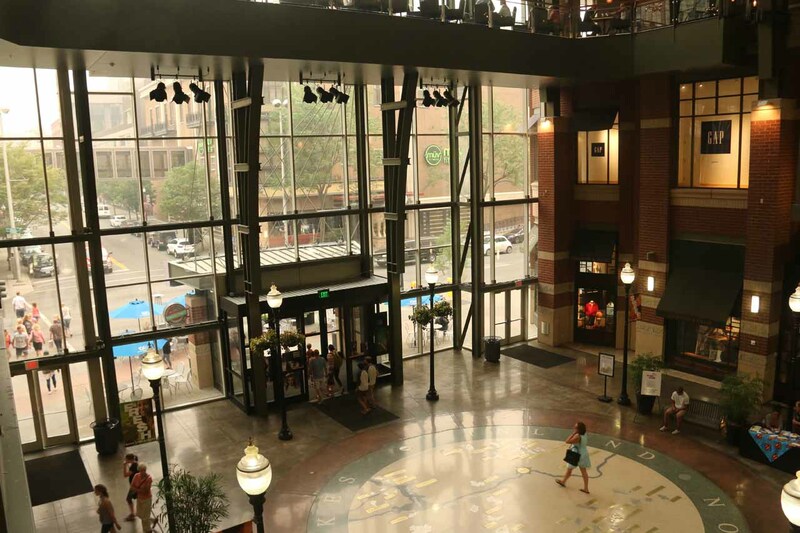 To give you some geographical context, Spokane was 10 miles (15 minutes drive) west of Spokane Valley, 279 miles (about 4.5 hours drive) east of Seattle, 151 miles (about 3 hours drive) north of Walla Walla, 34 miles (about 45 minutes drive) west of Coeur d’Alene, Idaho, and 197 miles (over 3 hours drive) west of Missoula, Montana.